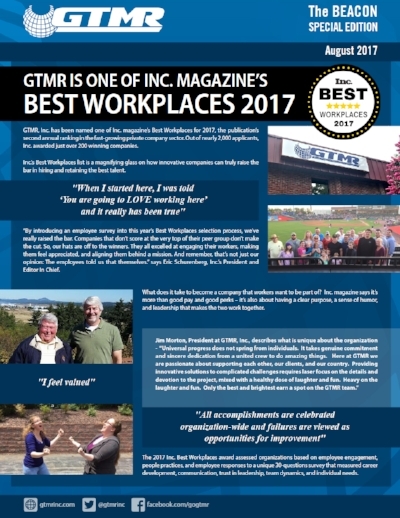 GTMR is one of INC. Magazine’s Best Workplaces 2017 — GTMR, Inc.
GTMR, Inc. has been named one of Inc. magazine’s Best Workplaces for 2017, the publication’s second annual ranking in the fast-growing private company sector. Out of nearly 2,000 applicants, Inc. awarded just over 200 winning companies. Inc.’s Best Workplaces list is a magnifying glass on how innovative companies can truly raise the bar in hiring and retaining the best talent. and leadership that makes the two work together. development, communication, trust in leadership, team dynamics, and individual needs. winning Engineering organizations nationally and 1 of only 7 winning organizations in Maryland. advocate for the organization, and intend to stay far into the future. • Strong company cultures breed stunning individual and team performance. • When employees feel valued by their organization, they are far more likely to be engaged. This single factor proved to be one of the largest drivers of employee engagement. Interactive Electronic Technical Manuals (IETM development), and Logistics. GTMR’s experience includes the generation of comprehensive and detailed specifications and requirements for major and minor subsystems as well as quick reaction capabilities. The company has direct participation and oversight in the development, testing, and implementation of these systems onto targeted platforms, whether it be an aircraft, ship or vehicle.